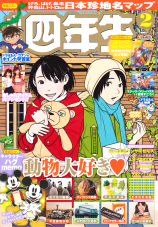 Shougaku Yon-Nensei, commonly referred to by fans as "Grade Four," is a magazine aimed at fourth graders in elementary school. 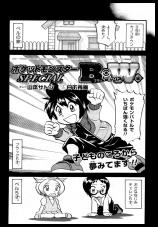 The magazine first started publishing Pocket Monsters Special BW Version in its December 2010 issue. Chapters of Pocket Monsters Special were not printed in the actual magazine itself; instead, they ran in small booklets sandwiched in the magazine. The height and length of these booklets were a little smaller than the graphic novel collections and are printed on lower quality paper than the CoroCoro Ichiban and Pokemon Fan chapters. On December 1st, 2011, it was announced that the magazine would cease publication with its March 2012 issue. Black looks at Musha and begins to reminisce about the day they first met. 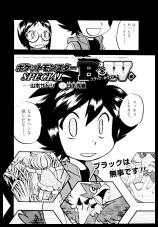 It was nine years ago, and Black, Bel, and Cheren were all five years old. Bel's father is upset that his daughter and her friends have been playing with his pokemon without his permission and forbids her from associating with them ever again. After seeing Bel burst into tears, Black steps forward, apologizes, and promises not to use an adult's pokemon again. He then tells Bel's father that he'll spend his time studying instead. After seeing how serious he is, Bel's father decides to permit his daughter to continue hanging out with her friends. After going to the library, Black learns about the Pokemon League and the various qualifications required to enter. Outside, Black gets lost in a daydream about winning the league. Bel decides that Black will need a pokemon first and foremost and sets out to find one. Shortly after her search begins, Bel is attacked by a wild Washibon! Cheren tries to shake Black out of his trance to help out, but he just stares blankly ahead. Suddenly, a wild Mun'na jumps out from some nearby bushes and attaches itself to Black's head! As Bel continues to flail about, the wild Mun'na begins feasting on Black's dreams. It runs away as soon as it's finished, leaving Black with a dazed look on his face. Now that his head full of dreams has been cleared out, he can focus on looking for clues as to why Bel was attacked. After studying the footprints in the area, Black guesses that Bel accidentally crushed a Berry that the wild Washibon was going to eat. He apologizes to the pokemon and presents it with some different Berries, so it decides to finally let go of Bel. Later, Black researches the pokemon he encountered and discovers that it evolves into a pokemon named Wargle. He decides to capture it, so he borrows some Monster Balls from Cheren's house and goes outside to look for it. When he finds the Washibon, he calls on the wild Mun'na who had helped clear his head earlier and asks it to battle for him. The pokemon agrees to cooperate and knocks Washibon out with a powerful Psychokinesis attack. After he catches Washibon, Black notices that the wild Mun'na wants to follow him to the Pokemon League as well! With that, Black captures his first two pokemon! 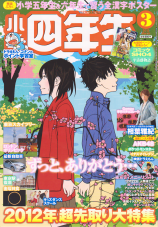 This is the final issue of Shougaku Yon-Nensei.